The static relations in occlusion include centric occlusion, protrusive occlusion, right and left lateral occlusion. All of these relations must be balanced with the simultaneous contacts of all the teeth on both sides of the arch at their very first contact. The cuspal inclines should be developed so that the teeth can glide from a more centric occlusion to eccentric positions without interference and without the introduction of rotating or tipping forces. The dynamic concept of occlusion is primarily concerned with opening and closing movements involved in mastication. Jaw movements and tooth contacts are made, as the teeth of one jaw glide over the teeth of the opposing jaw. Movements of the mandible which occur when the teeth are not in contact are termed as free movements. In 1914, 33° cuspal form was introduced by Gysi. He gave an inclination of 33° to the cuspal inclines to harmonize them with the condylar inclination of 33° to the horizontal. In lateral mandibular movements, cusps contact bilaterally to enhance the stability of the dentures. In centric occlusion, the masticatory forces directed toward the ridges [Figure 1]a. In a right lateral position, the occlusal contact forces are directed away from the ridges. In extreme working lateral position, contacts on both cusps incline, contact force are also directed outside the ridges [Figure 1]b. According to the concept, the occlusal surface of the mandibular posterior teeth had been reduced to increase the stability of the dentures. The maxillary posterior teeth have slight lingual occlusal inclines of 5° for first premolar, 10° for second premolar, and 15° for first and second molars, so that a balanced occlusion could be developed laterally as well as anteroposteriorly by the arrangement of teeth on a curved occlusal plane. In centric occlusion, half of width of mandibular posterior teeth helps to direct the masticatory forces in a buccal direction to the mandibular residual ridge [Figure 2]a. In a right lateral position, the occlusal contact forces are directed toward the ridges on the working side and away from the ridges on the balancing side [Figure 2]b.
Sears in 1922 with his chewing members and in 1927 with channel teeth (both were nonanatomic teeth) developed a balanced occlusion by a curved occlusal plane anteroposteriorly and laterally or with the use of a second molar ramp. In centric occlusion, nonanatomic teeth will exert contact forces toward the ridges [Figure 3]a. In the right lateral position, the occlusal contact forces directed toward the ridge on the working side and toward the buccal side of the ridge on the balancing side [Figure 3]b. 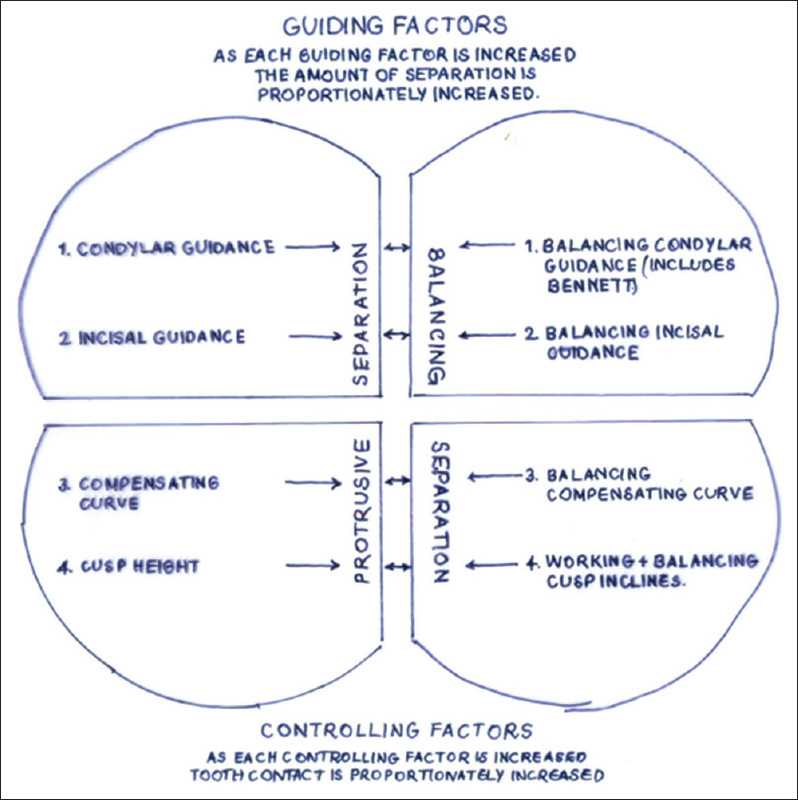 In 1937, Dr. Max Pleasure presented an occlusal scheme called the "pleasure curve," in which a reverse curve is used in the bicuspid area for lever balance, a flat scheme of occlusion is set in the first molar area, and a spherical scheme set in the second molar area by raising the buccal incline to provide for a balancing contact in lateral position. The distal of the second molar can also be elevated to produce a compensating curve for protrusive balance [Figure 4]a. Pleasure rationalized that the occlusion should be of special design due to the instability of the lower denture. Resultant forces should be directed vertically and or lingually. 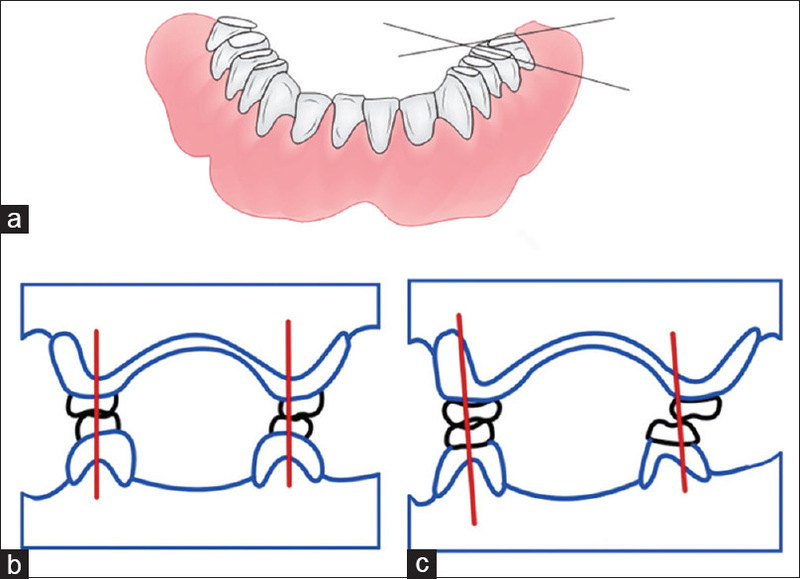 In centric occlusion, contact forces are directed toward the ridges [Figure 4]b and in right lateral working position, the occlusal forces are directed toward the lingual side of the lower ridge on the working side and toward the buccal side of the lower ridge on the balancing side depending on the inclination of second molar ramp [Figure 4]c.
In 1967, Frush gave the "Linear occlusal concept," which employed an arbitrary articulator balance, followed by intraoral corrections to obtain balance. A single mesiodistal ridge on the lower posterior teeth contacted a flat occlusal surface of the upper posterior teeth set at an angle to the horizontal. The intention was to eliminate deflective occlusal contacts and increased stability. In centric occlusion, contact forces directed toward the ridges according to the linear occlusal concept [Figure 5]a. In a right lateral position, the contact forces toward the ridge on the working side and slightly toward the buccal side of the lower ridge on the balancing side at a given inclination of 6° [Figure 5]b. In 1925, Rudolph L. Hanau presented a discussion paper entitled, "Articulation: Defined, analyzed, and formulated" [Figure 6]. He mathematically charted the nine factors and listed the laws of balanced articulation in a series of 44 statements. Hanau combined the original nine factors and reduced them to five. Thielemann subsequently simplified Hanau's factors in a formula for balanced articulation. [K × I]/[OP × C × OK]. Where, K = Condyle guidance. C = Cusp height inclinations. 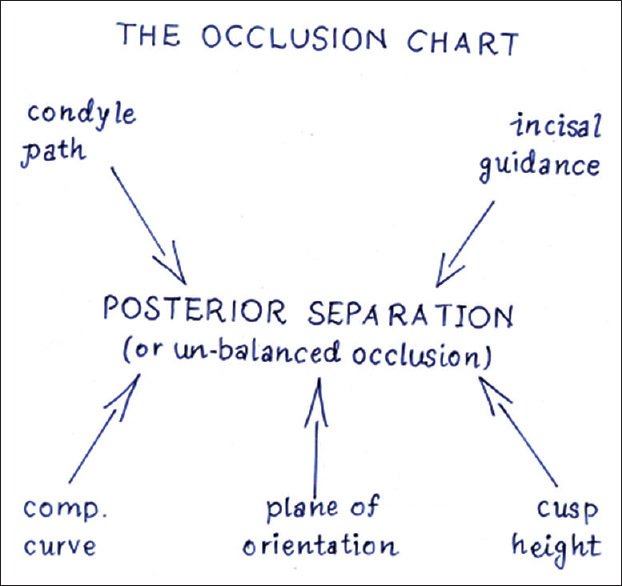 OP = Inclination of the occlusal plane. OK = Curvature of the occlusal surfaces. Trapozzano reviewed Hanau's five factors and decided that only three factors were actually concerned in obtaining balanced occlusion. He eliminated the plane of orientation since its location is highly variable within the available inner ridge space. 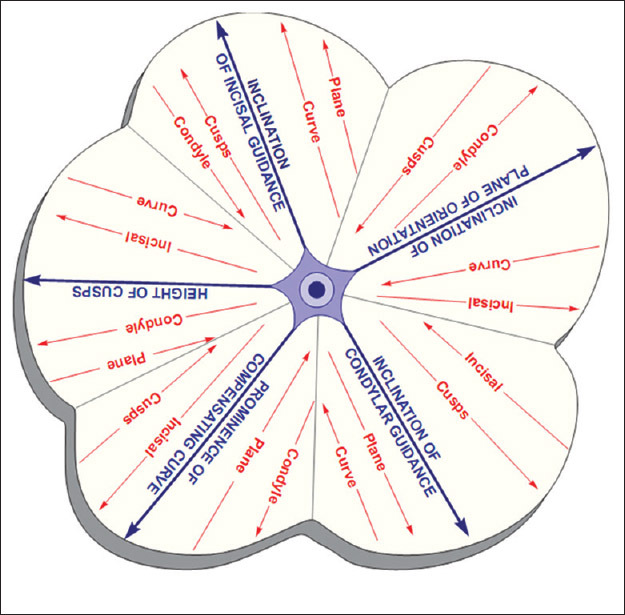 He also suggested that the occlusal plane can be located at various heights to favor a weaker ridge [Figure 7]. Trapozzano stated, no need for a compensating curve, as it is obsolete since the cuspal angulation will produce a balanced occlusion. The compensating curve enables one to increase the effective height of the cusps without changing the form of the teeth. The greater the separation of the teeth, the greater must be the posterior teeth. Bernard Levin's concept of the laws of articulation is quite similar to Lott's, but he eliminated the plane of orientation [Figure 9]. Cusp teeth have the inclines necessary for obtaining balanced occlusion but nearly always are used with a compensating curve. The Quad is relatively easy to understand and use. The concept of controlling posterior separation is an important goal for achieving a bilaterally balanced denture occlusion. Cuspless teeth are teeth designed without cuspal prominence on the occlusal surface. Hence, arranging modified anatomic teeth in a semi-adjustable articulator, which can accept face bow transfer and horizontal and lateral condylar guidance records from which incisal guidance can be established for every individual patient. Based on the interocclusal records, selective grinding is done to reduce the occlusal interferences to avoid deflective forces that are transmitted to the supporting structures. Then thorough patient education, motivation, and regular recall will preserve the health of the supporting structures for the longer period. Consequences of wearing the same complete dentures for a long period are attrition of artificial acrylic teeth and loss of occlusion. These conditions result in uneven force distribution and pathological changes in the underlying oral tissues, which will in turn results in poor patient comfort, destabilization of occlusion, inefficient masticatory function, and esthetic problems. Ultimately, patient may not be able to wear dentures and will be diagnosed as prosthetically maladaptive. The patients with complete dentures should follow a regular control schedule at yearly intervals so that an acceptable fit and stable occlusion can be maintained. Patient should be motivated to practice proper denture-wearing habits like not wearing dentures during the night. Complete edentulism not only hampers the mastication, esthetics, but also affects the psychological well-being of the patient. There has been much controversy about various concepts and the theories put forward to achieve occlusion. However, the use of these principles according to the individual merits of the case, have been neglected. Each case should be thoroughly evaluated based on the hard and soft tissue anatomy, resorption pattern, neuromuscular control, and the patient compliance. Palmer CA. Gerodontic nutrition and dietary counseling for prosthodontic patients. Dent Clin North Am 2003;47:355-71. Winkler S. Essentials of Complete Denture Prosthodontics. 2 nd ed. Delhi: AITBs Publishers; 2000. Boucher CO. Prosthodontic Treatment for Edentulous Patients. 9 th ed. Delhi: CBS Publishers; 1990. p. 119. Lang BR. Complete denture occlusion. 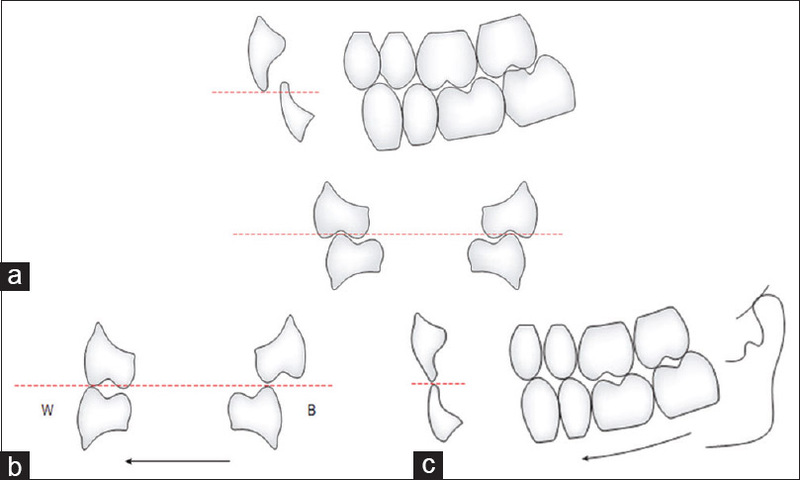 Dent Clin North Am 2004;48:641-65, vi. Beck HO. Occlusion as related to complete removable prosthodontics. J Prosthet Dent 1972;27:246-62. Levin B. A reevaluation of Hanau's Laws of Articulation and the Hanau Quint. J Prosthet Dent 1978;39:254-8. Zarb GA, Bolender CL. Prosthodontic Treatment for Edentulous Patients. 12 th ed. New Delhi: Mosby; 2004. Sheppard IM, Sheppard SM. Denture occlusion. J Prosthet Dent 1968;20:307-18. Brewer AA, Hudson DC. Application of miniaturised electronic devices to study of tooth contact in complete dentures, a progress report. J Prosthet Dent 1961;11:62-72. Rahn AO, Heartwell CM. Textbook of Complete Dentures. 5 th ed. Philadelphia: Lea and Febiger; 1993. Swenson MG. Complete Dentures. 1 st ed. St. Louis: C. V. Mosby Co.; 1940. p. 382. Sharry JJ. Complete Denture Prosthodontics. 3 rd ed. St. Louis: Blaktison Publication; 1974. Gibbs CH, Mahan PE, Lundeen HC, Brehnan K, Walsh EK, Holbrook WB. Occlusal forces during chewing and swallowing as measured by sound transmission. J Prosthet Dent 1981;46:443-9.